Browsing events like the International Fine Art and Antique Dealers Show isn’t just for potential buyers. Anyone interested in art and design should consider attending such shows. It hones your eye, educates you about the marketplace and helps put things in perspective across the board. In fact it’s this connecting the dots that’s my favorite aspect, tracing inspiration and finding common threads throughout disciplines and eras. While a source of inspiration for years, interest in India has been enjoying a recent resurgence. So I was pleased to see the booth of Samina Inc, the only gallery to specialize in “rare and collectable antique jewellery and jewelled arts of India.” When I mentioned to Dr. Samina Khanyar, the founder, that I have several books I need to revisit, including Made for Maharajahs, she replied, not surprisingly that the author, Amin Jaffer, is a close friend. 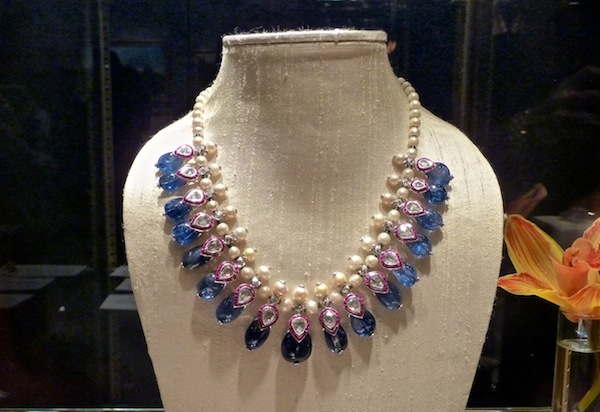 I was immediately taken with this stunning 20th century necklace, that “simulates the buds of the Michelia champaca flower.” With Burmese sapphires, rubies, diamonds and Basra pearls, the champakali necklace is one of the oldest Indian necklace designs. 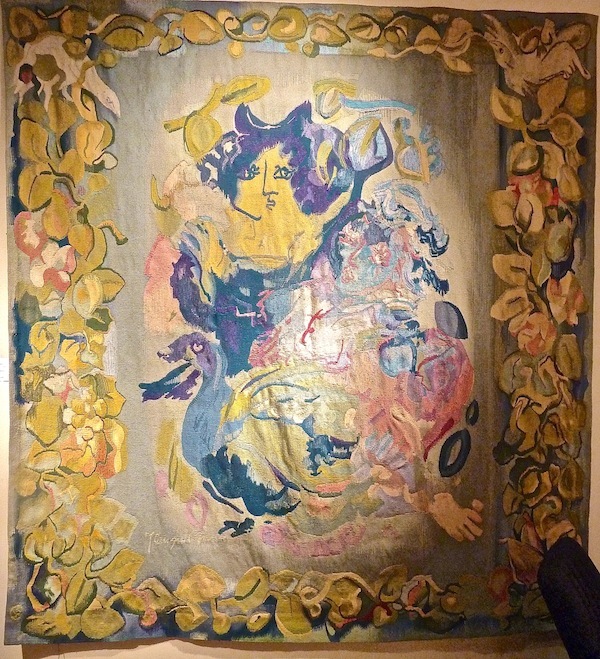 Jane Kahan is an internationally respected NYC gallery dealing primarily in modern masters but is also one of the few who carries fine art tapestries as well, including this beautiful Yvette Cauquil-Prince “La faune, la belle et l’oiseau” from 1960, above. 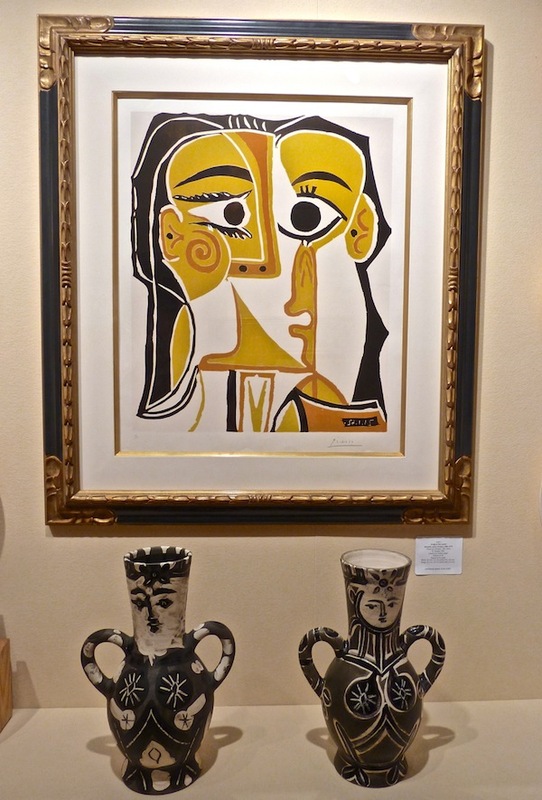 She was one of the first to deal in Picasso ceramics, seen above with his “Head of a Woman” linocut. John Mitchell Fine Paintings of London is a family owned third generation business, who had a beautiful collection of classic art at the show. 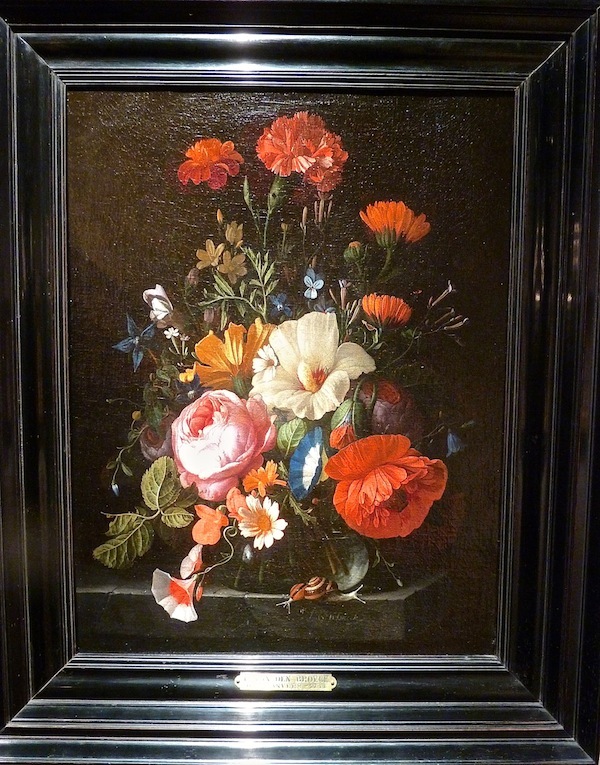 Dutch still lifes are one of my favorite genres and this lovely Elias van den Broeck was a pretty example. 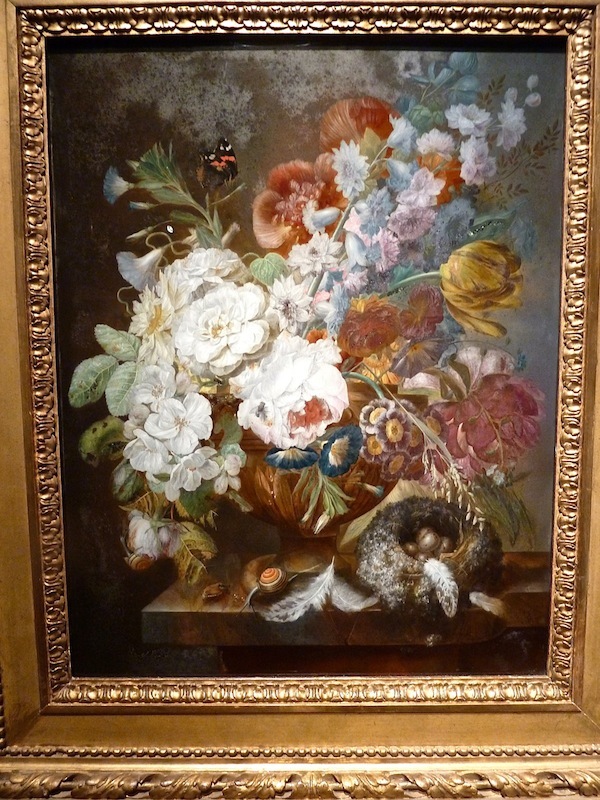 Painter Georg Frederik Ziesel lived in Antwerp where floral still lifes were especially popular, signifying an emphasis on home. What is truly amazing, however, is that this was reverse painted on glass. Beautiful even before I knew that, it was astounding to realize that all the intricate refined detail was hand painted backwards. 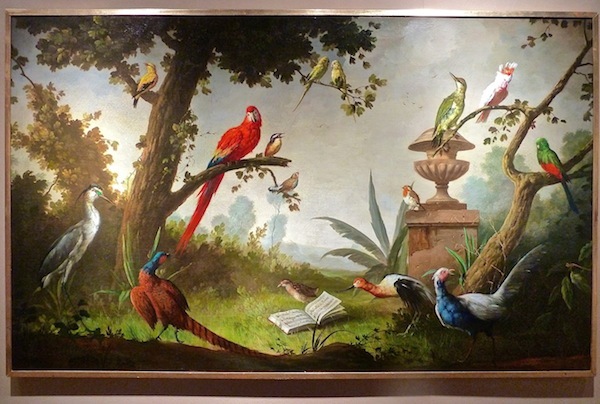 And from the French School, this 1820 “feathered choir” is charming. The brooding sky really sets off the menagerie of birds. I had intended to include more from the show today, but after a long day, my eyes are just not cooperating. So stop by on Sunday to see more from the show. This entry posted in art, fashion, furniture, interior design, jewelry. 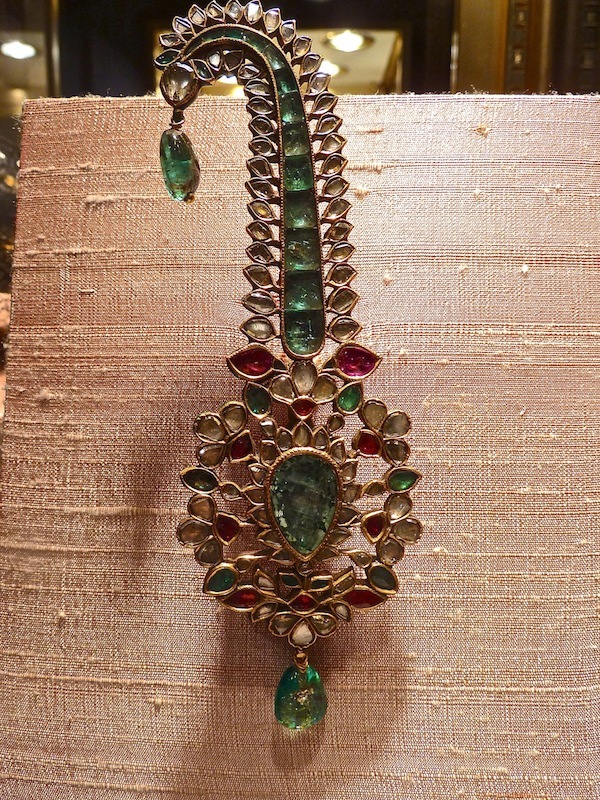 Entry Tags: art, Haughton Fairs, interior design, International Fine Art and Antique Dealers Show, Jane Kahan, Jewlery, John Mitchell Fine Paintings, Made for Maharajahs, Samina Inc. Bookmark the permalink. I love these choices. The “birds” is my favorite. Can’t wait for more. Thanks. 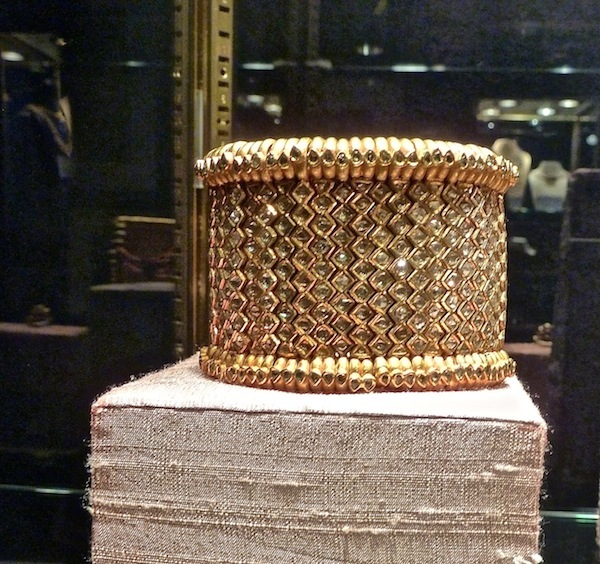 Another amazing post but I must say that the jewels really were a post in themselves! Wow. I just want to know what sorts of things caught your attention as a child? I can only imagine your level of taste was formed at an early age. It takes years to develop an eye for such appreciation. Now rest those eyes as best you know how and enjoy the weekend. I know you will be back with more tantalizing art, beauty and graciousness. I am taken with India – always have been. The skill set must be divinely inspired. All of these are gorgeous Stacy! The Picasseo pieces stunning!! 78 queries in 0.447 seconds.